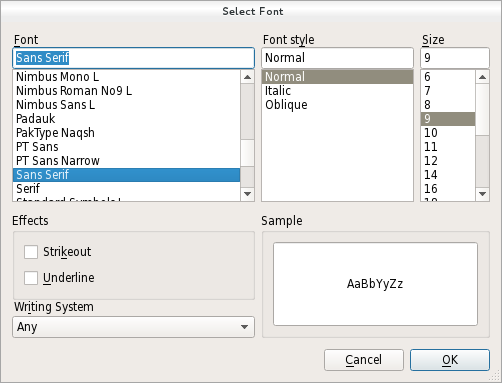 The QFontDialog class provides a dialog widget for selecting a font. A font dialog is created through one of the static getFont() functions. If the user clicks OK the font they chose will be used for myWidget, and if they click Cancel the original font is used. See also QFont, QFontInfo, QFontMetrics, QColorDialog, QFileDialog, and Standard Dialogs Example. This enum specifies various options that affect the look and feel of a font dialog. For instance, it allows to specify which type of font should be displayed. If none are specified all fonts available will be listed. Note that the font filtering options might not be supported on some platforms (e.g. Mac). They are always supported by the non native dialog (used on Windows or Linux). QFontDialog::DontUseNativeDialog 0x00000002 Use Qt's standard font dialog on the Mac instead of Apple's native font panel. The FontDialogOptions type is a typedef for QFlags<FontDialogOption>. It stores an OR combination of FontDialogOption values. See also options, setOption(), and testOption(). This property holds the current font of the dialog. Constructs a standard font dialog. Use setCurrentFont() to set the initial font attributes. The parent parameter is passed to the QDialog constructor. Constructs a standard font dialog with the given parent and specified initial color. Note: Getter function for property currentFont. See also setCurrentFont() and selectedFont(). This signal is emitted when the current font is changed. The new font is specified in font. The signal is emitted while a user is selecting a font. Ultimately, the chosen font may differ from the font currently selected. Note: Notifier signal for property currentFont. See also currentFont, fontSelected(), and selectedFont(). This signal is emitted when a font has been selected. The selected font is specified in font. The signal is only emitted when a user has chosen the final font to be used. It is not emitted while the user is changing the current font in the font dialog. See also selectedFont(), currentFontChanged(), and currentFont. Executes a modal font dialog and returns a font. If the user clicks OK, the selected font is returned. If the user clicks Cancel, the initial font is returned. The dialog is constructed with the given parent and the options specified in options. title is shown as the window title of the dialog and initial is the initially selected font. If the ok parameter is not-null, the value it refers to is set to true if the user clicks OK, and set to false if the user clicks Cancel. // value, in this case Times, 12. In this example, if the user clicks OK the font they chose will be used, and if they click Cancel the original font is used. Warning: Do not delete parent during the execution of the dialog. If you want to do this, you should create the dialog yourself using one of the QFontDialog constructors. If the user clicks OK, the selected font is returned. If the user clicks Cancel, the Qt default font is returned. The dialog is constructed with the given parent. If the ok parameter is not-null, the value it refers to is set to true if the user clicks OK, and false if the user clicks Cancel. Opens the dialog and connects its fontSelected() signal to the slot specified by receiver and member. Returns the font that the user selected by clicking the OK or equivalent button. Note: This font is not always the same as the font held by the currentFont property since the user can choose different fonts before finally selecting the one to use. Sets the font highlighted in the QFontDialog to the given font. Note: Setter function for property currentFont. See also currentFont() and selectedFont().